The daily harvest continues to be full of greens (like the spinach and radish greens) and radishes themselves. I found that radish greens sauteed in butter are fantastic! I'm not sure why I've never tried them before. Oh ya, I didn't have access to fresh radishes. 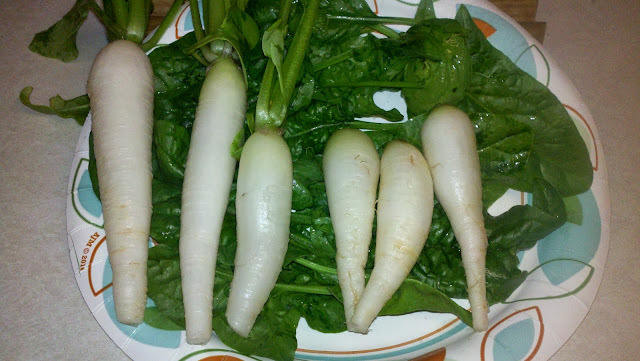 They're slightly spicy, but no where near like radishes themselves, thick but not chewy. Strawberries are putting on some berries, but since it's the first year, they're quite small and not really sweet. 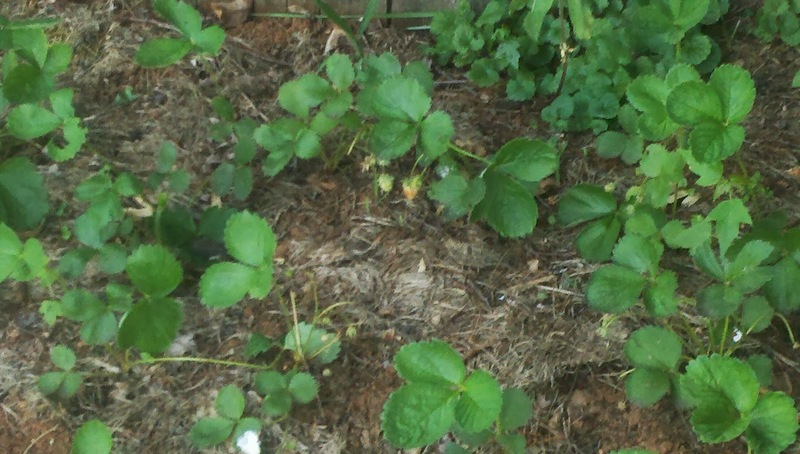 Additionally, my berry patch location has a lot more shade than I had thought. The Oak tree nearby put on it's leaves and well, now the patch has maybe 4 hours of sun. I'll have to move them this fall. The Jerusalem Artichoke patch is coming up nicely. No idea what to expect out of these but they're alive at least. The new pepper patch is coming along. The herbs and flowers are doing great. The large leaves at the top are Nasturtiums. They help repel pests and grow into a living mulch. On the bottom we have Marigolds which do the same thing. 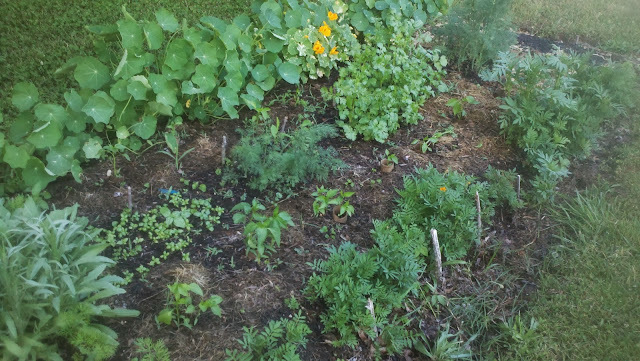 For the herbs, from the left we have bachelor's button, sweet basil, dill, cilantro, more dill, horehound, and then tai basil. 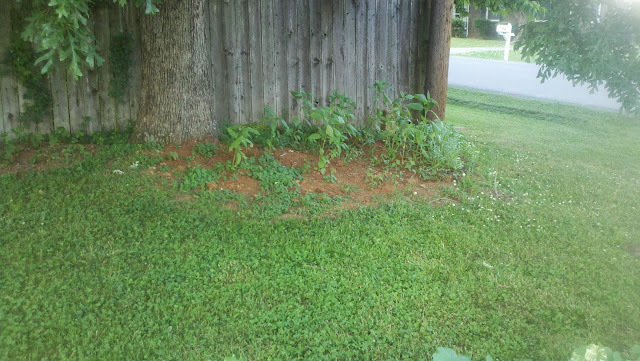 The peppers are not doing so well, again because of the unexpected shade from the oak tree. 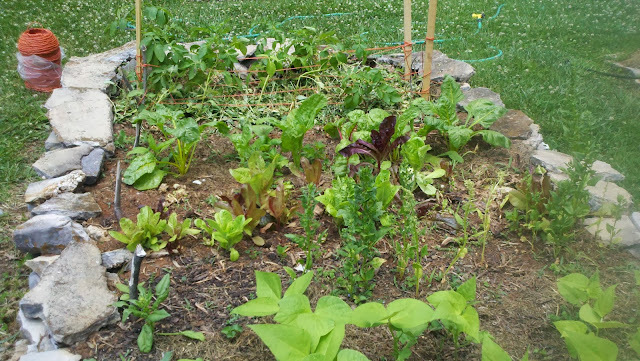 My first bed has been planted with (starting at the bottom) garden bush beans, spinach (now going to seed), romaine lettuce, swiss chard, and then peas. 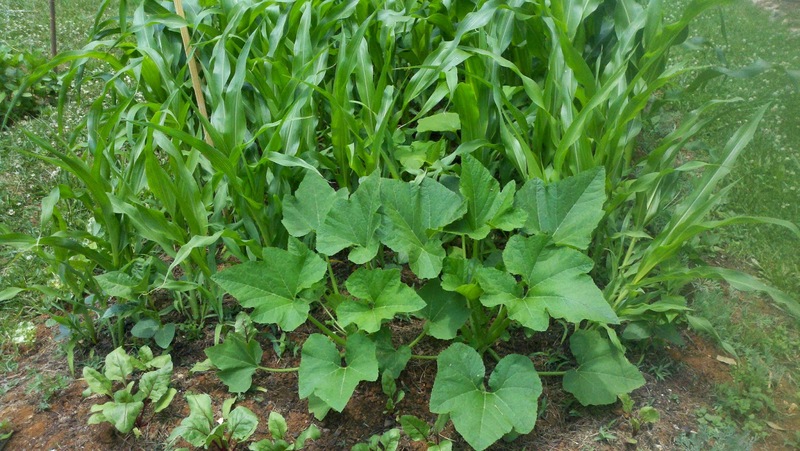 Another new bed is where I'm trying the 3 sisters companion planting (Corn, Beans, and Squash). It's coming up nicely. Here's the squash popping out the side with a bit of beets growing on the side. Quick note about fresh beets... they're fantastic. I do not enjoy beets from the store, but fresh, sauteed with some beet greens... very sweet, slightly crunchy, delicious! And lastly is the surprises from the compost pile. 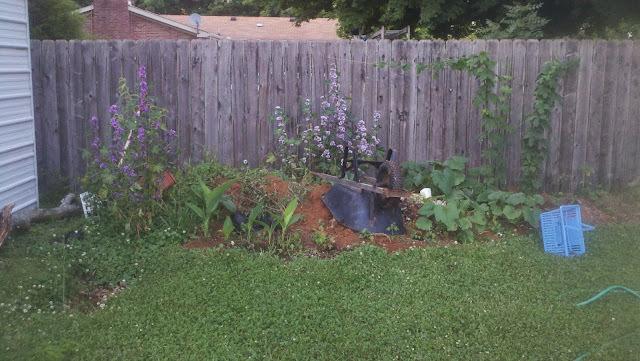 From the left we have Hollyhocks, some kind of green thing growing :), and some volunteer pumpkins. Also added a couple more hop varieties there on the right.